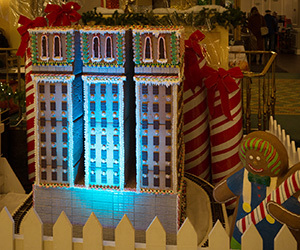 Gingerbread House Blog The Gingerbread House Blog covers All Things Gingerbread! We share our favorite recipes, tips on icing and decorating, free patterns and templates, and photos of gingerbread houses from plain to intricate to down-right strange. Click on that orange button to subscribe to this RSS feed and stay up-to-date on the latest and greatest Gingerbread House news. 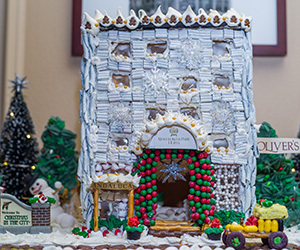 The holidays are not the holidays without a gingerbread house, so we set out to build the best one ever. We had two basic requirements: it had to look good, and it had to taste good. Check out the following tips to construct your own eye- and palate-pleasing creation. Make a template You can find a of gingerbread house templates online and print them out. If you’re feeling creative, try making your own like we did. A good tip is to not make any pieces too long, especially the roof, as it may be prone to caving. A rule of thumb is to not make any one piece longer than 20 cm, unless your gingerbread is particularly stiff. If you’d like to make your house bigger, you can make additions. A template allows you to plan the look of your house ahead of time and makes it much easier to cut your gingerbread pieces. Photo by Ani Yalamanchali Make your own gingerbread We used to make both the gingerbread and the royal icing and replaced the cake flour with 5 and 1/2 cups of all-purpose flour. This produced some of the best gingerbread I’ve eaten and struck a good balance between fluffy and firm. Have some extra flour on hand, as the dough does tend to become sticky as you work with it. Chilling the dough makes it much easier to roll out, and if you find it is becoming too sticky, add some flour to your hands and rolling pin. You can also try chilling an aluminum baking sheet in the fridge and placing it on the dough to cool it down. Let the gingerbread cool and harden, preferably overnight, before assembly. It would also be wise to make the roof first so it has more time to harden and to roll the roof pieces thinner than the base pieces. Photo by Ani Yalamanchali Use edible hot glue actually asked a civil engineer to build a gingerbread house. No joke. The best advice? Use melted down gummy bears to adhere the house. Simply place your gummy bear victims in a small pot and melt on low heat. Then use a popsicle stick, chopstick or small spoon to apply to your house piece edge. It literally functions like hot glue, except in edible, fruity form. Take care when handling the hot stuff. You might have to hold your house in place for several minutes, as heavy pieces like the roof are susceptible to slide, but as soon as the gummy sets, your house is not going anywhere. (In fact, it might even be a little difficult to pull apart to eat). Photo by Ani Yalamanchali Use a mix of icing types We used our homemade royal icing to adhere the gingerbread house pieces to our foam board base because it becomes very stiff as it dries. While this is good for keeping the house in place, it’s not as nice to eat. Luckily, store-bought icing often contains ingredients to prevent hardening, especially the ones that are labeled creamy. We cut the corner off a resealable plastic bag to pipe this on the windows, door and roof decorations, as well as spread it around the house to look like snow. Photo by Ani Yalamanchali Get creative with decorations We broke pretzel pieces and gummy glued them to make fences, used candy canes as columns and Starbursts as column bases (we microwaved them for 5-10 seconds to get them pliable). We also used peanuts to make the front pathway, which actually turned out very tasty with the icing. Feel free to explore and experiment. Some also suggest using cereal pieces for roof tiles, but after some contemplation, we decided to stick with a classic frosted roof. Part of me is convinced that Wheat Thins would make the ideal roof tile, but I’m not sure how that would taste…… Photo by Ani Yalamanchali Of course, it’s practically a requirement to sprinkle powdered sugar over your completed house, even if it’s not actually snowing outside. DIY Gingerbread House Sticker Scenes is rated 4.5 out of 5 by 38. • y_2018, m_12, d_20, h_4 • bvseo_bulk, prod_bvrr, vn_bulk_2.0.9 • cp_1, bvpage1 • co_hasreviews, tv_10, tr_28 • loc_en_US, sid_57_6399, prod, sort_[SortEntry(order=FEATURED, direction=DESCENDING), SortEntry(order=SUBMISSION_TIME, direction=DESCENDING)] • clientName_orientaltrading • bvseo_sdk, java_sdk, bvseo-3.2.0 • CLOUD, getAggregateRating, 15ms • REVIEWS, PRODUCT Be sure to have these on hand for holiday baking day, Christmas parties or any holiday event! Kids will love decorating their own gingerbread houses with these removable stickers. Includes 12 paper 11" x 8 1/2" backgrounds and 12 sheets of repositionable and acid free stickers. (51 stickers per sheet) © OTC Rated 5 out of 5 by RCKindergarten from Love this craft. Every year I purchase this craft for my class Christmas Party. I read the Gingerbread baby book, we search for Gingerbread men in the classroom, play candy land and do this gingerbread house craft. I used to make real gingerbread houses with my Kindergarten class, but when I found this craft that all changed. This craft is not messy, Kindergarten students can do this by themselves and they can take it home easily. Thank you Oriental Trading for another great craft. Rated 3 out of 5 by KPChicago from Stickers don’t stick! I bought these for a Christmas party with kids of various ages. They all enjoyed this project, but I was annoyed because most of the stickers fell off immediately. I considered buying a similar craft for another kids party and even though it was at a major discount, I decided not to because of the “sticker” issue with this item. To be honest, this didn’t seem to bother any of the kids. We just stuck some shipping tape on each sheet and the problem was solved. Rated 4 out of 5 by shavjhn1 from Fun, easy project for pre k I used these sticker pages for my Pre K students and they enjoyed it. My only complaint was that the stickers tore easily as my students pulled them off of the sheet. Other than that, it was good. There are more than enough stickers per sheet so we are going to use them for another activity later. Rated 4 out of 5 by CuteandCrafty from Fun Gingerbread House for Kids My kids had a great time placing the stickers on the gingerbread houses. This entertained them for about 20 minutes. Paper is sturdy and stickers are vibrant. The only small negative thing is that some of the stickers seem to be too big, so they appeared too close together when placed on the paper. Gingerbread House Decorating Ideas, Cake Decorating, Candy For Gingerbread Houses, White Gingerbread House, Gingerbread Village, Gingerbread Decorations, Christmas Candy Crafts, Holiday Candy, Christmas Goodies. Elizabeth Gardner. Gingerbread house. Quick and easy M&M and Mike and Ike Christmas Lights. Christmas Fun Christmas Cakes Candy Christmas Trees Candy Crafts For Christmas Holiday Treats Cute Christmas Desserts Kids Christmas Treats Candy Christmas Decorations Xmas Food. Gingerbread house lights! : D. Elizabeth Gardner Make play equipment for the back yard of your Wilton gingerbread house! Candy sticks, spice drops, stick gum and string licorice make a sweet swing set. Theresa Goldman. Gingerbread houses. 5.19 USD. Be sure to have these on hand for holiday baking day, Christmas parties or any holiday event! 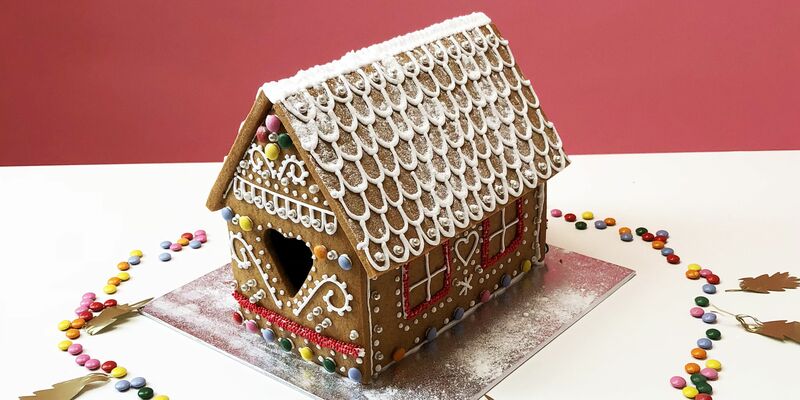 Kids will love decorating their own gingerbread houses w.read more. Gingerbread house. Loading. Preparation time Pipe some icing along the wall edges and join the house together on the iced cake board. Leave the icing to dry and harden for a minimum of four hours, but preferably overnight. Once dry, place two night-lights inside the house before attaching the roof. Cut the pointed ends of the cocktail sticks into 1cm/½in pieces (you should have 12 small pointed pieces) Stick the front door in place with icing. Cut the back door into three pieces to use as props to keep the trees upright. Decorate the Christmas trees with piped icing and fix them onto the cake board with icing and gingerbread props. Dust the roof with icing sugar and light the night lights using a candle lighter through the open back door.